When you are wearing a nice dress, an apron protects it from spills and spatters. 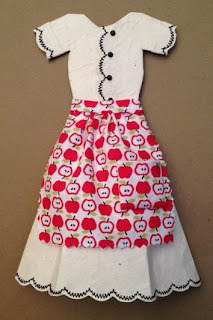 Actually, I just loved the apple fabric but didn't want to use it for a complete dress. Paper dress with stitching, apron from cotton fabric. Such a cute print just in time for Thanksgiving. Love the stitching trim - good to have a sewing machine.